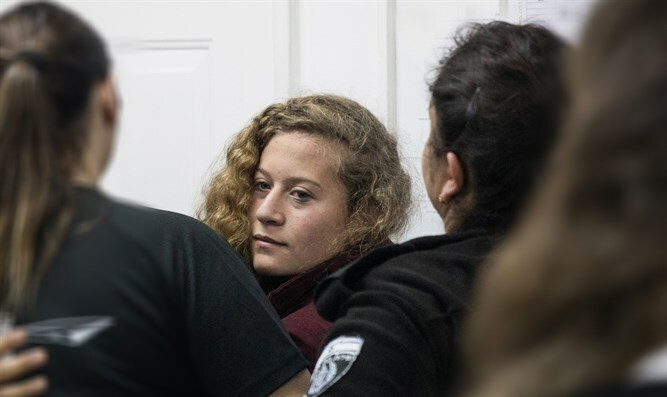 MainAll NewsIn Other News...Who closed Ahed Tamimi's Twitter account? Who closed Ahed Tamimi's Twitter account? 16-year old Ahed Tamimi's Twitter account was deleted or closed, reports say. Filmed kicking and slapping soldiers last week, Tamimi later said she assaulted the soldier because "he had shot her cousin with a rubber bullet" and she "could not keep quiet." Following the account closure, Tamimi's supporters immediately opened a new account demanding Twitter reopen Tamimi's original account. Though Twitter itself did not take responsibility for the act, family members hinted that the Twiiter staff was responsible for the account's closure, claiming the decision was made at "Zionists' behest." On December 18, Twitter began enforcing its new rules regarding what may and may not be posted. In its section on "hateful conduct," Twitter bans forbids users to "promote violence against, threaten, or harass other people on the basis of race, ethnicity, national origin, sexual orientation, gender, gender identity, religious affiliation, age, disability, or serious disease." The site delineates rule regarding "hateful imagery and display names" as well, writing that "you may not use hateful images or symbols in your profile image or profile header. You also may not use your username, display name, or profile bio to engage in abusive behavior, such as targeted harassment or expressing hate towards a person, group, or protected category."